Silver nanoparticles are increasingly being used in consumer products, such as clothing and personal care products, in the medical and pharmaceutical industry, and in the food industry. That is why their presence is expected to increase in the environment where they can exert harmful effects on organisms. 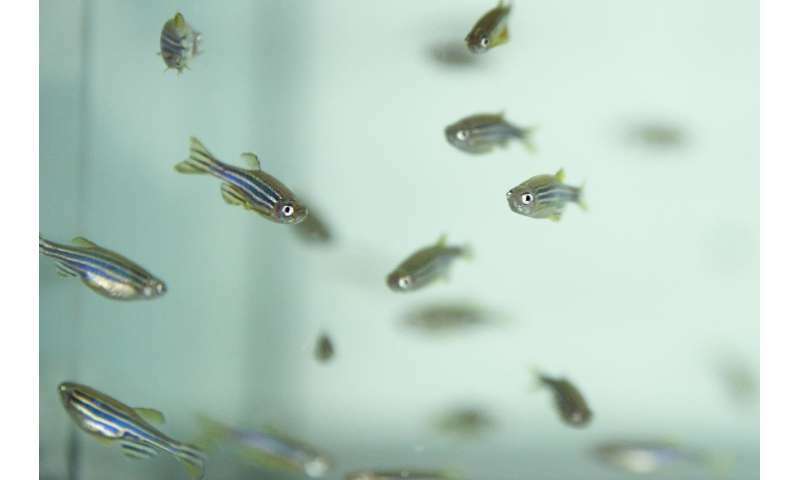 The UPV/EHU's Cell Biology in Environmental Toxicology research group has analysed adult zebrafish to find the effects that can be caused in the long term by silver particles present in fresh water. What stands out among the main conclusions of the study is the fact that the distribution of the metal in the organs of the fish is influenced by the form of silver (soluble or nanoparticles) in the water. Soluble silver was also found to cause short-term alterations (three days) and nanoparticles longer-term alterations (21 days); in both cases, the animals cleansed the silver accumulated in their bodies after spending six months in clean waters, although inflammation of the gills was persistent after exposure to silver. In the study, led by Amaia Orbea, three groups of 50 to 60 adult zebrafish each were used in three aquaria. Silver nitrate was added to the first tank to produce water-soluble silver; 20-nm silver nanoparticles (NP Ag) were added to the second; clean water was added to the third, which was used as the control. The groups in the contaminated tanks remained exposed to both forms of the metal for 21 days before spending a further six months in clean water for the purpose of studying the consequences of long-term exposure to silver. A concentration of metal regarded as environmentally significant was used, in other words, a concentration that could be found in nature, for example at the outfall of wastewater from treatment plants. The accumulation of a substance is the first step for intoxication to take place. After three and 21 days of exposure to silver and after six months in clean water, various chemical and biological analyses were carried out on the gills, liver and intestines of the fish. The research team selected the gills because they are the main entry route of the contaminants; the liver because it is the main organ in metabolism and detoxification; and the intestine because the silver nanoparticles can be absorbed through food. The fish accumulate similar concentrations of metal after being exposed to soluble silver and silver nanoparticles. After six months in clean water, the initial metal concentration levels were recovered. The conclusions differed when the organs of the fish were analysed. The distribution of silver in the liver and intestines depended on the type of metal used in the treatment, but both treatments led to inflammation of the gills of the fish, an effect that remained even after six months in clean water.